There has been a significant lack of land cover change studies in relation to deforestation in the Democratic People’s Republic of Korea (North Korea). The purpose of this study is to characterize deforestation in North Korea through land cover change trajectory and spatial analysis. We used three 30-m gridded land cover data sets for North Korea representing the conditions of the late 1980s, 1990s, and 2000s, respectively, as well as a digital elevation model. We examined the land cover trajectories during the two decades, i.e., which land cover became which at the pixel level. In addition, we calculated topographic characteristics of deforested pixels. 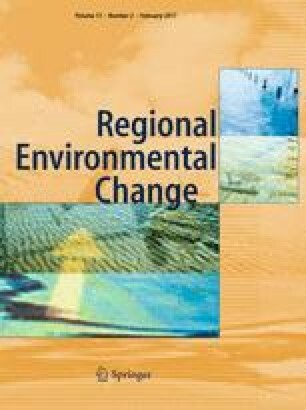 Major findings from the study are summarized as follows: (1) net forest loss in North Korea was negligible in the latter decade compared to the former (>5000 km2), whereas other land cover changes were still active; (2) as a result of deforestation, forest land cover became mostly agricultural, particularly in the latter decade (95 %); (3) expansion of agricultural land cover continued during the time, increasing by >42 %; and (4) elevation and slope of deforested areas decreased slightly in the latter decade. The key contribution of the study is that it has demonstrated which land cover became which at the 30-m pixel level, complementing existing studies that examined overall forest stock in North Korea. This work was supported by a grant from the International Scholar Program at Kyung Hee University in 2015.